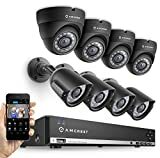 The Amcrest 960H 8CH 1T Security System is your best pick for the safety of your property.The cameras are durable and weatherproof. The cameras will also shoot good resolution videos day or night. You also get a security that the 1-Terabyte hard drive will record any criminal activity for days if needed. Our second pick is the ZOSI 720p HD-TVI Home Surveillance Camera System. You get the safety of durable weatherproof cameras that shoot good video quality day or night. You also get access to USB backup to share any crimes or incidents that might occur on your property. The budget pick is the iSmartAlarm iSA3 Preferred Package Home Security System. You can monitor your home at an affordable price. It is engineered to be endlessly customizable for your needs and easy to configure. It can also be merged with Smart devices in your home. Home security is engineered on the principles of protection hardware and best practices. Without well built cameras, sensors, locks, doors and recorders you don’t have any tools for monitoring your property. At the same time, all of your devices won’t save you if you choose to leave doors unlocked or alarms unarmed. Half the job of securing your home is deciding which systems to install. The second half is practicing the habit of locking doors and setting alarm systems. All security systems operate on the principal of networked components. Without the complete communication of all the parts, security is impossible. The typical hardware includes at least one control panel for arming and disarming the alarms. Door and window sensors are also common, along with a loud alarm. No system would be complete without motion sensors and tracking cameras. The cameras can be inside or outside, but both are preferable. Finally, security will not deter criminals when they are unaware of its presence. All systems should include warning signs that are clearly visible. Control Panel: The control panel is the central computer that monitors all of the sensors and cameras. It also triggers the alarm when security is broken and communicates the alert with the monitoring company. You can typically arm and disarm the system from a touchpad using a code. The control panel will also typically feature a digital video recorder that logs the incoming video feeds. Support for remote access from your Smartphone is also common on many services. Door and Window Sensors: Door and window sensors are typically built of two components. One component is installed to the frame, and the other is attached to the door or window. When the window is closed, the two components form a circuit. Any action that breaks the circuit will trigger an alarm. The sensors can be wired to your property or wireless. Motion Sensors: When armed, these sensors monitor areas within your home. The sensors are typically targeted towards watching rooms containing valuables. Any motion within the room will trigger the cameras, alarm, and then notify the property owner. The sensors can be ultrasonic, infrared, microwave, or a combination. It is also common for security companies to sell subscriptions for remote monitoring. Cameras: Surveillance Cameras are available in both wired and wireless configurations. They are also available as standard cameras or with night vision. Many manufactures build cameras that include both features. The cameras are generally set to watch entry points like doors, remote buildings like workshops, and distant areas of the property. When selecting which camera to buy, it is very important to decide ahead of time which rooms you want to monitor. You should generally purchase cameras with the best resolution available. It is also adventurous to choose cameras with a wide viewing angles and a short focal length. The cameras are perfect for documenting events in confined spaces. In large open spaces, the opposite is true. Cameras with small viewing angles and long focal lengths are the best choice. Modern features typically allow the homeowner to monitor their property anywhere in the world using a Smartphone or tablet. Security companies typically provide applications for Apple and Android devices. This can be very useful when you are at work or out of town. Homeowners can monitor deliveries, caregivers, landscapers, and even the arrival of their children from school. The cameras will also capture any crimes or attempted crimes on your property. Alarm: The alarm should be amply loud to alert the neighbors and anyone inside the house that a problem has occurred. The alarm will also notify any invader that the police are on the way. Today it is common for providers to alert you with your Smartphone when there is a problem. Sometimes alerts will be false and the police are unnecessary. Many manufacturers will also watch your property remotely for a subscription. Yard Sign: You wouldn’t purchase a gun and not tell anyone about it? The sign is worth more than marketing for the security company. It is a warning to any prospective criminal that your home is professionally monitored and not the best choice for a target. It is recommended that you clearly place the sign at all of the entrances to your home. When choosing a home security network, you should carefully consider the features available. This is important not only for you, but your family. Their safety is at risk, if the system can’t reliably photograph and record any crimes that occur in or near your house. You also need a system that is smart and capable of detecting potential intruders. You should also consider purchasing a system that you can view remotely, because threats will visit your home when you are away. To be safe you really need to choose a network that you can afford that excels in all areas. Motion Activation: All security systems available today should have the capability of motion activation. It is no longer feasible any more to set-up and monitor all the video feeds around and inside your house. The advent of modern computers has made it obsolete and even optimal for cameras to be motion activated. Modern hard drives do have very high capacity, but you still don’t want to document everything. Select a unit that is tuned to trigger only when suspicious activity is detected and you will have no trouble monitoring your property around the clock. Motion sensors can be ultrasound, microwave, Infrared, or any combination of the above. Infrared & Night Vision: It can be a dark world out there, and in more ways than one. Criminals are dark people and they like to work in the shadows. To be safe you also need to see them where they hide. You need to choose a system that can clearly see intruders in the darkest of night and at a large distance. Consider purchasing a network that includes both conventional and night vision cameras. Today these features are often combined. You will find that the quality of Infrared cameras varies widely. Deciding which camera to purchase is one of the most important considerations in security. Today it is very common for cameras to have built-in Infrared LED illuminators. Remote Viewing: Tragedies happen everyday, and you won’t always be home to deal with it. Everyday homes are burglarized, vandalized, or catch fire. You no longer need to be at your home to monitor your home. The invention of the Internet and Smartphones gives you the capacity to monitor and react to events from the comfort of your desk anywhere in the world. When choosing a security system, pick one that includes applications for your Apple or Android phone. Security is also a two-edged sword. Poorly secured applications add the risk of hacking to your household. Unsecured networks can be monitored by people outside your property. You should choose networks with high-encryption standards and use difficult passcodes. You should always obey all of the set-up instructions. DVR Hard Drive: You will never be capable of monitoring your home around the clock. Even with remote viewing, this is not really an option. You also will need a feature to document any activities and or crimes that occur on your property. Any system worth purchasing should include a functional digital video recorder (DVR) hard drive for recording and to provide evidence to the police for prosecution. Digital video recorder technology has made much advancement recently and now images can now be intelligently searched with ease. You can now smartly search video for important events. Units with at least a Terabyte of memory are becoming routinely available. Manufacturers are increasingly offering cloud services for video storage. The cloud can cause reliability and connection problems. It is not the preferred method for storing video evidence. High Video Resolution: All of these features are without value if you can’t photograph the intruder. One of the most important decisions in buying any network is the resolution of the cameras. All conventional and night vision cameras should be of the highest resolution and pixel rate available. The pixel rate is proportional to the resolution. The resolutions are always given in terms of horizontal and vertical numbers. For example, a camera could feature a resolution of 1200 × 800. At a minimum, you should buy a 2-megapixel camera. You should double the resolution when you are monitoring large areas like a backyard. It is also advisable that you purchase cameras that can be tilted, swiveled, and zoomed. Cameras are typically sold as bullets, domes, or boxes. Larger cases provide more room for optics and generally better graphics. Visible cameras can deter criminals, but they are also of greater risk of vandalism. Cameras can be concealed, but at the cost of image quality. The Amcrest 960H 8CH 1TB Security System is our best pick for security. The network is built with durable weatherproof cameras fitted with night vision and capable of viewing objects at a large distance. It can also record events for up to six days in high definition. You also get the comfort of acclaimed positive reviews from Amazon buyers. Day and Night Surveillance: When you purchase Amcrest, you get four high-resolution cameras fitted with 3.6-millimeter lenses for high clarity. The cameras are equipped with two dozen Infrared LED lights for night viewing. Clear images can be captured as far away as 65 feet. Ample Memory: 3-Terabytes of memory are built in. That is adequate for 6-days of continuous high-resolution recording or over thirty days of low resolution recording. Smart Motion Detection: You can program the system to activate alarms with specific conditions to avoid false alarms. Once the sensors are triggered, the alarm sounds and you are notified by email. All of the cameras automatically start recording to the hard drive. Remote Monitoring: You can monitor your property distantly with an application interface (API) compatible with your personal computer and Android Smartphone. Flaws but Not Dealbrakers: There are still a few shortcomings with Amcrest. No live customer tech support is available. You should also be prepared to run a lot of wires to install the system. 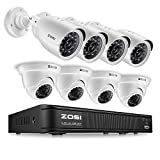 Your next best pick is the Zosi 720p HD-TVU Home Surveillance Camera System. The system is built with 720 pixel high-definition weatherproof cameras for crisp vision. You also get ultra long digital video recording with easy USB backup. Day & Night Surveillance: You get eight high-definition weatherproof cameras for daytime and nighttime use. Each camera includes built-in Infrared filters and a range up to 65 feet at night. Easy Remote Access Setup: The network is fully compatible with your Apple or Android smartphone. You only need to scan the QR code provided with the package to connect your device to the free ZOSI view app. Long Recordings: This feature requires a hard drive, sold separately. You get very long continuous recording. The digital video recorder will automatically overwrite old data. You also get intelligent motion detection recording. Support: The system is CE & FCC certified for reliability with your wireless. You also get free lifetime tech support. Flaws: The manufacturer does not provide any hard drive for data storage on the digital video recorder. It is up to the buyer to purchase and configure a hard drive. It might be to complicated for some consumers. Your best pick for a wired network is the Amcrest 720P HD Over Analog (HDCVI) 8CH Video Security System. The system features high definition weatherproof cameras with night vision. You can also monitor your property from a Windows computer or Android phone. Clear Picture: Amcrest’s High Definition Over Analog System produces crisp clear pictures with good resolution. Since the video feed is analog, there is no lag in transmission and details can be clearly resolved. Remote Viewing: The network includes a unique and beautiful Application Interface (API) for remotely monitoring and managing your property from Windows browsers or your Smartphone. Day and Night Surveillance: During the daytime you get excellent picture quality from 3.6-millimeter camera lenses with 75 degree viewing angles. The cameras also include high-intensity Infrared LEDs for night vision. iOS/Android App: The app is very easy to install and set up on your Smartphone. All that you need to do is scan the QR code printed on the surface of the digital video recorder (DVR) box. Then you can name the network and activate a “start live preview”. Within the app, you can zoom, pan, or tilt an image. You can also switch between streams and capture screenshots. You even have the option to playback recorded videos within the application. Flaws: Consumers have reported frequent technical issues with the system. There have also been complaints about the quality of the night vision; people have complained that it can be blurry in darkness. 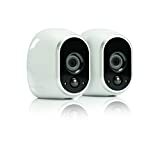 The Arlo Smart Home Security Camera System is your best choice for a wireless network. You can install the cameras anywhere without the need of wires. The cameras have built in motion detection and can see at night. You can even capture video clips and receive alerts when you are away from home. Wireless: All of the cameras are wireless and can be placed anywhere on magnetic mounts. Consumers have the option of mounting cameras at any angle that provides the best view. Night Vision: The cameras have built in night vision and high-definition clarity. You can even photograph images at large distances. Smart Motion Detection: The cameras include a built-in Infrared sensor to detect motion. You will receive an alert when the camera is triggered on your app. Weatherproof: The cameras are durable and can be installed anywhere in your house. You even have the option of installing the cameras outdoors. Flaws: The cameras will record indefinitely once triggered. You need to set a shut-off timer or stop the recording manually. Consumers have also complained about a delay in recording after the cameras are triggered from sleep mode. You also don’t get around the clock monitoring. The Foscam FI9901EP is the best choice for night vision. The camera can operate outdoors, and with 30 Infrared LEDs it can penetrate the darkness up to 65 feet. Clear Picture: The camera is 4-megapixel image quality and is capable of zooming in on distant objects. You can also zoom in on images within the Application Interface (API). Night Vision: Each camera also features 30 powerful Infrared LEDs to illuminate distant objects. Flaws: You will have to run cables to install the security system. Logitech Circle Wireless HD is the best for an indoor camera. It is easy to set up and can be run from an app on your Smartphone. It even includes a built-in battery for disruptions. Additional features include free cloud storage for 24-hours. Easy Setup: The camera can be easily assembled and configured. You can have the unit out of the box and fully assembled in a minute. Cloud Storage: The device comes with free 24-hour storage on the cloud. You can download, replay, and share videos. The data is safe even if the camera is lost or destroyed. The basic service provides 30-seconds of free recording. Easy Communication: The camera is compatible with the Firefox, Safari, and Chrome browsers. Logitech also provides it own monitoring app. You can talk with family over a built in microphone. Surveillance: 1080 pixel camera is included and it is capable of video streaming. The device is programmed to alert you to any detected motion. Amazon Alexa: This product is engineered to be compatible with Amazon Alexa. You can remotely control the camera with voice command. Flaws: Consumers have complained that the camera performs badly in poor lighting. The sun and indoor lights can also saturate the camera. People have also complained about the unit not adjusting to changing lighting conditions. There have also been complaints about the battery life. The GW Security 8 Channel System is your best choice for properties located in harsh climates. The cameras are designed for the most brutal conditions and provide high-resolution pictures even outdoors. The network is also easy to install and durable. Remote Viewing: You can remotely monitor your property at anytime from your Smartphone or tablet. Excellent Cameras: The cameras record in 2-megapixel high-resolution, which is above average for security cameras. Anti-Interference: New low-frequency modulation technology reduces interference and improves video quality. Long-distance Communication: The use of coaxial cables extends transmission to 1000 feet, far beyond the range of conventional security networks. The cables also reduce video distortion. Flaws: Configuring the software can be a real challenge with this system. The Q-See QT5682-8AG is your best choice for unhardened security. You wouldn’t buy a waterproof jacket when it never rains. The cameras with the Q-See are weatherproof but not waterproof. They still provide high-definition quality pictures and night vision up to 100 feet. You can also live stream videos to your Windows computer or Smartphone. 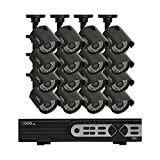 Excellent Cameras: With the kit you get eight high-resolution and weatherproof cameras. The system can also be upgraded to 720-pixel resolution. Good Surveillance: The cameras can photograph good quality pictures up to 100 feet. You also get good image quality in total darkness. Scanning: With the Q-See View App, you can easily connect to your digital video recorder for instant live viewing on a Smartphone. This can be accomplished with one click. Easy Installation: The system includes an integrated Startup Wizard. Once the digital video recorder is started, the Wizard will guide you through all the steps of configuring the network. Flaws: One major drawback is the omission of a power button from the digital video recorder. You have to manually unplug it to stop the recorder. You also don’t get any spare fasteners if you lose or break them. 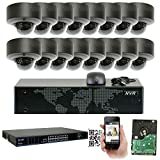 The GW Security 16CH 1080P NVR is your choice if you have money. The cameras are built to withstand any weather and provide excellent night vision features. You also get remote access capabilities and the ability to connect to diverse Smart Home electronics. Picture Quality: Each camera features 5.0-megapixel resolution that is three times sharper than conventional security cameras. Remote Access: You can access the network from your Smartphone over 3G networks and Wi-Fi. Night Vision: The cameras also feature excellent clarity even in total darkness. Weatherproof: The cameras are built to operate in even the most extreme weather. Flaws: You should expect a challenge in the set up and operation of the network. Consumers have complained that the user manual is confusing and also that the network interface is difficult to understand. Your cheapest option for security is the iSmartAlarm iSA3. With the iSmart, you get the features of a basic functional security network with very simple do it yourself (DIY) set-up. The system is designed with the capacity for endless expansion. It is also engineered for compatibility with smart home applications. The system requires no subscriptions. Surveillance: The basic system includes two easy to install door sensors and one motion detector. Remote Monitoring: Also included in the system is application support. Applications are compatible with Apple and Android smartphones, and they will alert you of any activity in your home. You can get alerts by phone calls, texts, or emails. You can also monitor your property from your phone anywhere with a good Internet connection. Flaws: One serious disadvantage of the iSmartAlarm is that no cameras are included with the basic system. You can still purchase and install cameras yourself. You also have the option of networking as many sensors as you need to be secure. Since this is do it yourself, you are on your own for any mistakes or security holes. Q: Do I need more than one camera? A: Before you even consider purchasing a security system, you should evaluate the risks to your property. How many entrances do you have at your home or office? Is your space located in a larger building with its own security? If you are only worried about guarding a single entrance, than one camera should be adequate. For any property with more entrances, you really should buy a multiple camera system. You should also purchase cameras with night vision capacity. As a general rule, four cameras are the minimum for a small home or business. Each sensitive entrance should have a camera focused on it. Q: Will you be using the camera indoors or out? A: Indoor cameras have the advantage of being smaller, lighter, and easier to hide. Outdoor cameras are more expensive because they must be built to withstand harsh weather and the vandalism of thieves. Many of the highest quality cameras can be used indoors or out. For an additional cost, you can purchase cameras disguised as ordinary objects. Q: Do I need to worry about lighting conditions? A: While many buildings are illuminated by streetlights today, dimly lit places are still a hazard and an opportunity for criminals. You have two options. You can either upgrade the lighting or invest in an Infrared camera. You might not even need an Infrared camera; certain cameras are optimized to work in low light. When shopping for cameras, purchase a unit with the lowest LUX rating available. The lower the rating, the better the camera is in low light. Q: How wide of an angle do I need for a camera? A: You should generally buy cameras with short focal lengths and wide angles. They are optimal for monitoring small spaces like offices, living rooms, and entrances. Properly configured, you could watch an entire room with the right camera. Short focal length cameras are not adequate for monitoring large expanses like sports fields. In that situation you really need a long focal length and short angle camera. Q: What amount of resolution do I need? A: Security cameras should generally use the highest resolution available. However, this is not always practical. Higher resolution equates to higher memory needs and less recording time. When criminals strike, identifying their face or even license plate is a necessity. 2-megapixels resolution should be adequate for most situations. If you need to monitor large expanses, upgrade to 4-megapixels. Q: Do I need weather resistant cameras? A: Any cameras that you intend to use outdoors need to be hardened against the weather. You will not achieve any security using cameras outside of their design. Cameras are optical devices like your eyes, and they should be shielded from snow and rain under structures like roof overhangs. You will also need to periodically clean and check outdoor cameras for the best security. Q: How easily can I set up my security system? A: You should always consult with the instructions provided by the manufacturer. Wired systems will be more tedious to configure than wireless networks, but they are more resilient. Wired systems require more expertise in setting up secure networks. Q: How easily can I remotely view my security cameras? A: You should always consult with the instruction manual or the manufacturer before making a purchase. Each system has its own features and complexities. Networks with built in Smartphone compatibility are preferred. Many digital video recorders also include the feature out of the box. You will need a reliable high-speed connection in your home and a good connection wherever you are. Q: Is the manufacturer of the network important. A: It is best to deal with businesses that are experts in security. Don’t buy from a manufacturer that sells security as a side product. Networks will break down and you should work with a company that provides technical support. Q: What should I consider before I buy? A: First you should consider the risks to your household or business. How many entrances do you need to guard? Where do you keep your valuables? Ideally you should monitor each room with its own camera at the highest resolution available. Monitoring the outdoors is another option. If you have items outside that you want protected, regular motion activated lights are an easy upgrade without having to buy night vision cameras. I would not even contemplate buying a system without some level of tech support. You will have problems at some point, and you shouldn’t be guessing with your own security. I’d also purchase a unit with Smartphone features. At times you will get false alerts, and there is no security in calling the police to your property for every incident. Security warnings can also go a long way towards persuading criminals not to attack your possessions. No matter which system you purchase, make sure you attach the stickers around your property. Q: What features should I avoid when buying a system? A: Buying any home security camera system is a major decision. You need a network that you can afford, but that is also reliable. You also need a system that provides many features. Sadly, the industry is very unregulated and there are many mistakes that you can easily make. Buying Cheap: Purchasing a security system that is cheap is not always the best decision. Cheap cameras may market themselves as offering the same features as their more expensive competitors, but that service comes with a price. The cheap cameras and systems are often Do It Yourself (DIY) projects. You will find that the cameras are more difficult to set-up, use, and the application software is sometimes below standard. No Night Vision: Unless you plan to illuminate the space at all times, night vision is essential for any camera network that you purchase. It is easy for many buyers to overlook this feature, or be distracted by the marketing hype. Generally speaking, cheap cameras will produce a grainy video that is unhelpful when crime strikes. Before you even consider buying a camera, arrange a demonstration from a retailer. You could also investigate finding images and reviews from consumers. Neglecting Subscriptions: Do not forget to investigate any subscription fees that might be attached to a system. These systems are often non-functional if you don’t pay the fees, and the fees can be very substantial. Some companies have been known to sell cheap cameras and charge hefty subscriptions for otherwise basic service. You should always add the subscription fees to the final cost. There are plenty of fully featured cameras available that don’t have fees. Privacy: Security can be a two-edged sword. You want to watch any criminals that might harm you, but you don’t want them to watch you. Your privacy can be compromised when using wireless cameras or systems that fully rely on the cloud. Today many cameras are secured by 128-bit encryption or higher. You still need to secure the network with a strong passcode. There are also advantages to buying systems that store the footage locally on a digital video recorder. They are much less sensitive to hacking and interference than networks that solely use the cloud. Gimmicks: Don’t be seduced by the latest Kickstarter campaign or new product launch. New goods can be cool, but they can also be much more risky. Security devices need to be reliable, and they can’t be when the company is unestablished. When you do buy a security network, the company should provide tech support for years to come. Computer networks can also be hacked or even buggy despite the best efforts of the manufacturer. Your system will need periodic updates from a reliable business over the years. The Future: You should expect to spend at least a few hundred dollars on new security. The device that you choose today should be a perfect solution for your needs. It should also not be your final solution. There is one thing about security, your needs will change. For example, you might need to install an outdoor camera after expanding your property. What about changes in smart home products in the coming years? You should only buy services that can be used across multiple platforms. It is also important to buy systems that support multiple users. Verifying Specifications: Specifications can be misleading when researching hardware details. For example, the resolution of a camera can also be dependent on its frame rate and the amount of Infrared LEDs that it uses. Poor hardware choices could give you a camera that performs exceptionally well in the daytime but terribly at night. If you can’t find reliable information or a product demonstration, your best bet is finding footage shared by owners. Before you buy you should really investigate how the service really works. Plan for the Worst: You should always hope for the best and plan for the worst. When shopping for a security service, ignore the marketing hype. For example, maybe the cloud storage is free but it only records for thirty seconds. Or maybe you get a day of continuous recordings, but no search feature. Buying poorly engineered security can be as painstaking as locating the evidence if you are ever the victim of a crime. When you buy security, it should be easy to locate and share evidence. The Amcrest-960H-8CH Video Security System is your best selection for safety. It is your best value for your money because it comes with weatherproof cameras that can resolve objects clearly in the daytime and night. You also get the 3-Terabytes of memory for up to six days of recordings. The system also provides you with notification alerts when the camera is activated and the ability to monitor your property remotely.